Ivan always had a fascination with death, especially after watching his father die a premature death. This fascination with death lead Ivan to work as an embalmer in one of Waterdeep’s premier mortuaries. His work on the corpses would bring visions of the other side to him in his dreams. These visions led him to a secret cult of worshippers of Kelemvor. 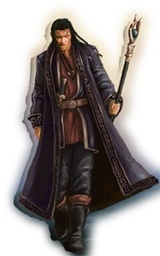 The high cleric helped Ivan fulfill his destiny and tap into his hidden arcane talents. When the owner of the mortuary learned of Ivan’s secret life he forced him out of the mortuary. Ivan then listened to the whispered visions and left Waterdeep, determined to find his true destiny.